by	Plitvice Times	4. December 2018. This collection of short films called “The Last Paradises” takes the audience on an eye candy trip around the world. The flight around the globe begins with a visit to the ice bears in the Wapusk National Park in Northern Canada. Empathetic footage of newborn ice bears is succeeded by images of turquoise-coloured water cascades in the world famous Croatian National Park at the Plitvice Lakes. In Ethiopia, the so-called bleeding heart monkeys, or Geladas, give us insights into their lives in the pack on the high plateaus of the Simien National Park. From here, it’s off way down to the Earth’s south and the Great Barrier Reef in Australia. The 1500 species of fish, 350 stone coral and 80 soft coral types are all endangered by acute coral bleaching. Before long, these images may only exist on film. Now, the viewer is taken from this colourful and gigantic, subterranean massif to the kingdom of the stone giants: in the Alps. The fascination of mountain sculptures continues at China’s Li River. 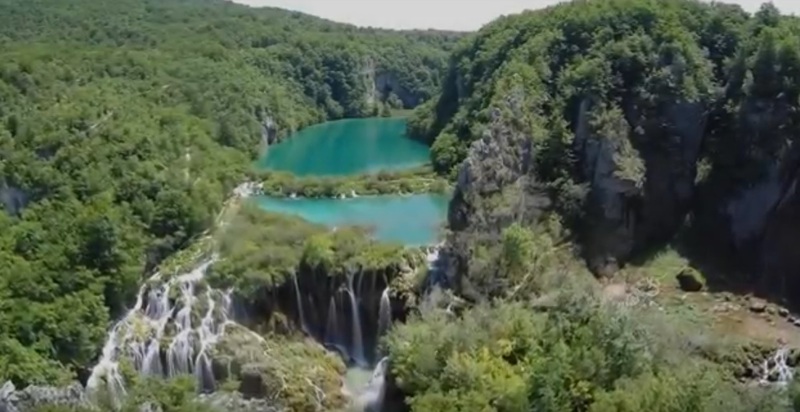 Enjoy the video and for the part with Plitvice Lakes skip to the 7th minute.